When you click on ‘This PC’ on Windows 10, unlike the previous versions of Windows, you may be able to see many other folders along with hard drives, removable memory devices and network locations. In previous versions of Windows 10, ‘This PC’, is known as ‘My Computer’. My Computer contains only hard drives, removable storages and network locations. If you feel that ‘This PC’ looks clumsy, then you can customize them. You can make the Desktop, Documents, Downloads, Music, Pictures and Video folders, invisible. But for that you have to do little registry hack. This will result in hiding these files from This PC in File Explorer, but you can still get these files from ‘Quick Access View’. You are allowed to hide certain folders without hacking the registry. All you have to do is to click on ‘Folders’ heading which is seen on the top of ‘This PC’ view. By doing so, it will be altered. Windows will retain this and it will stay altered whenever you open a certain File Explorer Window. This could work in certain PCs, where you are not allowed to alter your registry, especially those you are using for work purposes. Inorder to perform a registry hack, the first thing that you have to do is to check whether Windows 10 is 64-bit or 32-bit version. You can check it by opening the ‘Start Menu’ and then click on ‘Settings’. Then go to ‘System’, from there select ‘About’ and there look for ‘System Type’. There you will be able to the type of operating system that you are using. Now you have to download ‘Remove User Folders From This PC’. Then open the file and then run the correct .reg file on your PC by selecting it and agreeing the warning for ‘Registry Editor’. You have to select either “Remove All Folders From This PC 64-bit.reg” file or the “Remove All Folders From This PC 32-bit.reg” file. By doing so, all the folders, that used to appear on ‘This PC View’, will be removed from there. But this process will take time. You have to either restart Explorer.exe process or to restart the PC to complete the process. 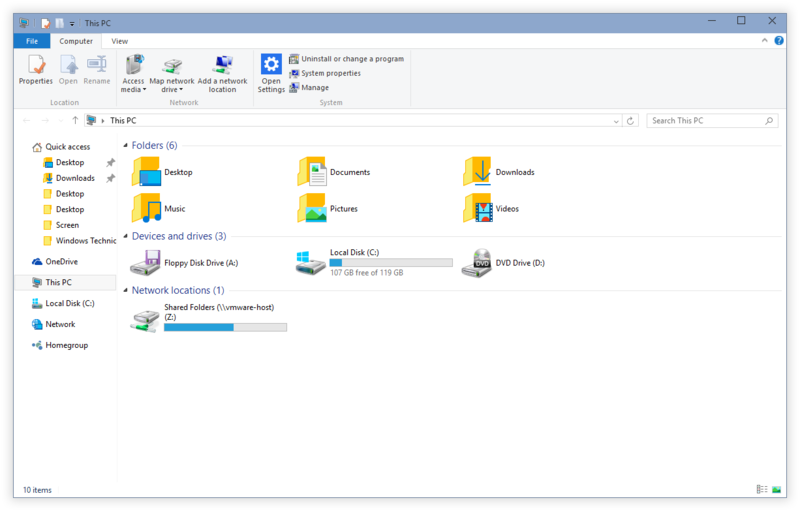 The above step will remove the entire pack of folders from ‘This PC View’. This can be done by running the specific .reg files to remove the selected folders. There are separate .reg files for Desktop, Documents, Downloads, Music, Pictures and Videos Folders. With the help of these separate .reg files, you can remove them as well as restore them. To make the process complete, after running the .reg file, you have to restart your PC. Windows 10 used to save the list of folders in HKEY_LOCAL_MACHINE\SOFTWARE\Microsoft\Windows\CurrentVersion\Explorer\MyComputer\NameSpace\ in the registry. When it comes to 64-bit version of Windows 10, the lists of folders are stored under HKEY_LOCAL_MACHINE\SOFTWARE\Wow6432Node\Microsoft\Windows\CurrentVersion\Explorer\MyComputer\NameSpace. The registry hacks that shown above removes the particular folder keys from these lists. Those which are designed to restore those folders will add them to these lists. If you want to see the lists of folders removed from the list, then you have to right click on .reg files and the click on ‘Edit’. By doing so, you are able to see which keys have been removed and which keys have been added to the above list.